I swear, I didn’t buy this for the box. What’s great about Hostel Thailand, aside from its proximity to the BTS Skytrain station, is that it’s near Silom, Bankok’s central business district. Because of this, there’s plenty of small restaurants and shops catering to the employees working in the surrounding buildings. One of them was this pastry shop I always pass by on the way to and from the hostel. 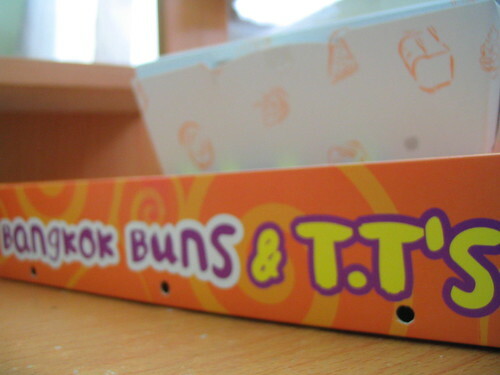 The buns were flaky and has different kinds of fillings. It was delicious, and they have clippings of magazine and newspaper articles posted, to prove it. Good thing you didn’t post pictures of the buns; I would’ve been salivating right now!! !